Calgarians with a penchant for timepieces can now get a close look at the inner workings of a rare clock — the last of its kind in Canada — that has been in the tower at Old City Hall for more than a century. The clock is now on display in the atrium at the Municipal Building — the big blue building right next to Old City Hall — until the fall, when it will be reinstalled in the clock tower. Calgary jewelry firm D.E. Black was contracted to supply the clock, choosing the 16A model, which was the latest available at the time. 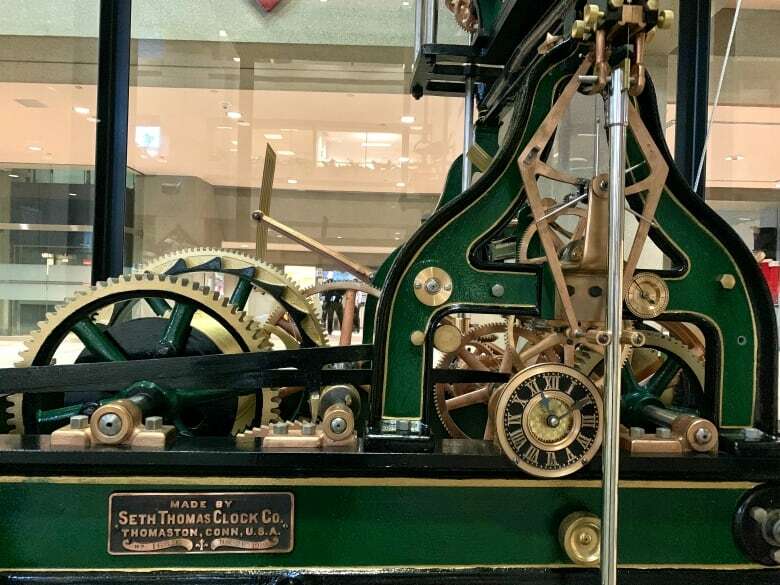 It was manufactured by the Seth Thomas Clock Company of Connecticut, at a cost of about $3,500, which is equivalent to about $92,000 today. One of only 50 of the model ever made — and one of 12 still operating without modernizations like auto-winding or electronics — the clock was installed in the five-storey tower at Old City Hall in 1911. It's the only remaining timepiece of its kind in Canada. The clock was originally installed by Rudolph Engel and synched with the "official" Canadian Pacific Railway time. 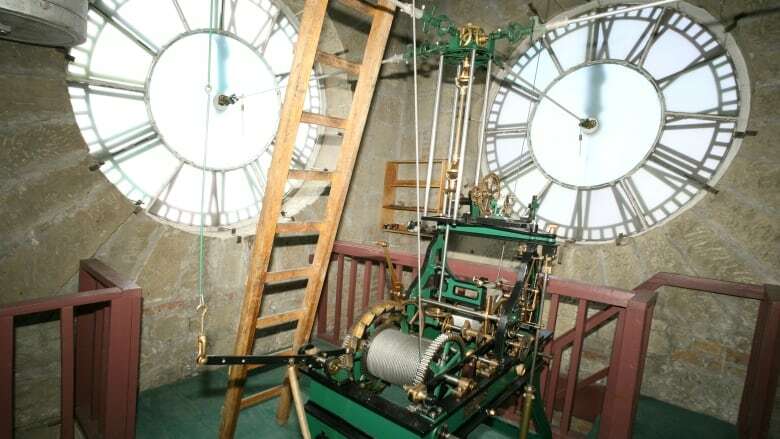 Designed to strike on the hour, the four-faced clock was fitted with a 680-kilogram bell and was guaranteed to run within a variation of 10 seconds per month. The total weight of the clock parts is 1,800 kilograms. Repair and restoration of the clock was included in rehabilitation work ongoing at Old City Hall. 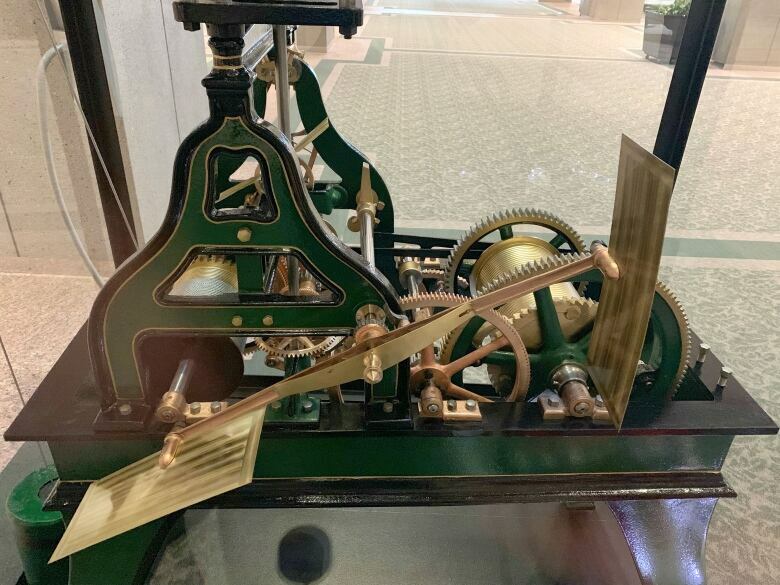 "With only 50 clocks of this particular model ever manufactured, this clock is a valuable historical timepiece and is one of the most defining features of historic City Hall," Darrell Bell, the city's acting director of facility management, said in a statement. "I'm excited that we are able to share this historical artifact with Calgarians, and I encourage all citizens to come and take advantage of this unique opportunity to see the clock up-close over the next year." The clock will be housed in a transparent display case that will also be used to protect it when it is reinstalled.